I have been following one of my hobbies semi-closely as of late…that being politics. It is semi-closely due to the ideological entrenchments, vindictiveness, and seeking of power for power that is a bit of a turn off currently. However, that bit of a turn off is why citizens need to engage to hold these parties accountable that are acting like sandbox bullies in a pre-school. In Ontario we are 5 months into a Doug Ford Progressive Conservative Government, and not seeing either progressive or conservative policies coming to the surface. There is MPP’s under investigation in the governing party, rumours that at least seven are about to defect (could be upwards to 14 which would sink the majority)…one already has, placing citizens she represents over party politics and the faux standing ovations her party is whipped to do. Yet that is not what has touched on me to write tonight. Neither here in Alberta the UCP and NDP using an Alberta Party motion to curtail oil production to aid a flagging sector. Both parties claiming it is there idea…and well…that is just politics as normal sadly for third party ideas with the governing and official opposition. For decades the Liberals and Progressive Conservatives federally did it with the “conscience of Parliament” the CCF then NDP. But that is not why I am writing. Or that the UCP continue to holds to the idea of a massive majority due to polls. Even though those same polls show numbers shrinking for the party and the leader. As well, the short term memory issue of the polls in the last 3 elections in Alberta that respectively were projecting majorities for the Wildrose, the Wildrose, and the PC. What happened for governance was PC, PC, and NDP. Sooo polling in Alberta not so good. But that is not what brought me to write. It was a piece on the Prince Edward Island Green Party. Within the next 11 months there is to be a provincial election. The Progressive Conservatives are idle and imploding not being able to keep a leader. The governing Liberal Party has been in power 11 years, and even with a new leader is looking tired. The NDP has only ever held one seat in 1996. The Greens appear to make a break through, and possibly form a government. Yes it would historically be the first Green Party government within Canada. The major thrust being that they are not the same old tired song, but also the PEI Greens have done admirably what other Greens in Canada have not been able to do– show their whole platform with strong local candidates. Having said that, I do think the Green Party of Canada, under Elizabeth May’s leadership could be the surprise of the 2019 federal election in October. Partly due to the introversion of the Scheer Cons, and the lost path of the Singh NDP. What it will take though is strong local riding candidates from a diverse background known in their area. It will also take getting their non-environmental policies on the table to show the strong Red Tory-Blue Grit style policy the party creates. Thus showing it as a strong centrist option to Trudeau’s Liberals. The topping on the cake for this decades old federal party would be getting key endorsements from patriarchs and matriarchs of the Progressive Conservative movement of yore: Rt. Hon. Brian Mulroney, Rt. Hon. Joe Clark, Rt. Hon. Kim Campbell. Perhaps even swing to the Liberals and see if the Rt. Hon. Paul Martin will endorse. Lastly, with the reading done in Preston Manning’s theology around social justice and environment it is highly plausible they may be able to get an endorsement by the father of Reform, the Hon. Preston Manning. If these things could align, knowing May will be in the leaders debate it could shake up Parliament from the same old same old. How to bring back constitutional promises? The Constitution Act 1982 does not speak of political parties, what it does promise is that at each level of governance Canadians are guaranteed peace, order and good governance. In fact it has been a transformational journey of our young Westminster Parliament compared to others, but we can still learn a lot from the “Mother” parliament of the UK, and other styled parliaments within the Commonwealth. Australia Broadcasting Corporation poked fun at their system in the Fifth and Final season of Rake, that saw Cleaver Greene as a senator, and a rapid succession of Prime Ministers as the party caucus members that controlled kept cycling through to find the one that “worked”. Canada has been seen as one of the most “party” controlled parliaments, in fact, more likely, Leader and their circle controlled. Now you can rebut and say party members elect the leader, yes, but after that what happens? What if the person in the House or Legislature is not up to the job? Do elected members have an ability to make a good change? How is the first minister chosen? We have defaulted to the leader of the party with the most seats. Are there ideas for changing things? 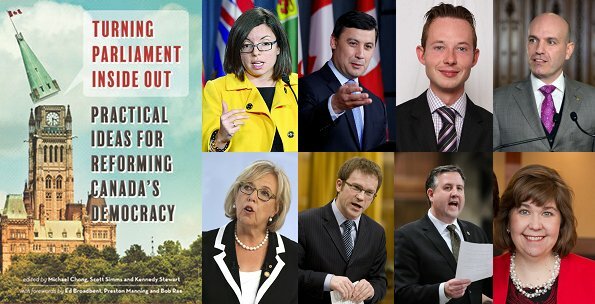 A multi-party work came out in 2017 that shone some lights on change: Turning Parliament Inside Out: Practical Ideas for Reforming Canada’s Democracy (Douglas & McIntyre); editors: Michael Chong, Scott Simms and Kennedy Stewart. The book was forwarded by Bob Rae, Ed Broadbent and Preston Manning. It has submissions from Members of Parliament across party lines (including Elizabeth May). For most politico it is nothing astonishing, it is a solid collection of 8 ways to give power back to elected representatives and decentralize from the leaders (and by extension PMO in governance) office. The eight essays are easy to follow, well laid out, and easy to discuss for those involved in the systems of politics and those not. For EDA’s; and parties I would encourage reading and discussion groups on the topics. For the non-partisan, get a few friends together to read and discuss the ideas. Even better is that it can be used as a starting point for discussions on what reforms (minor to major) that need to happen. Such things as the “official party” seat number is just a function, not a rule. How are questions taken/answered in question period? How to get more people involved as candidates? And the list can go on. What are your thoughts on Parliamentary/Legislature reform? What steps can happen at the local level? What can happen within parties? The conversation of change that threatens power can be a scary one. Mostly because it comes down to the reality that moving forward there will be those accessing power, you were not allowed access to in the same moments of your journey. Yet for constitutional health of our nation, it is a conversation that leads to action that needs to happen. And it simply begins with talking over a cup of coffee…like so many political movements that shaped our nation and world…. When truly, we have many stones to repair in Castle Le Canada. When have I been Haman in my world? When have I found a voice like Esther? The third is where you find the resonating with the love of the Holy Mystery to take forward. Another spiritual practice would be to rewrite the story from the hardest point of view you have: King, Esther, Mortdecai, Ex-Queen, Haman? What truths are revealed for your life? But I digress as this is not a theology lesson, but rather a time to be eclectic and percolate some thoughts in our souls as Canadians where next steps lay for our Just Society. Aboriginal Health Care– due to treaty and the colonial-patriarchy of reserves this falls under Federal auspices, yet any Constitutional Act 1982 student (BNA Act 1867) know that this means literal limbo for our First Nations family members as the true provider of health care is provincial. So how do we truly reconcile, move forward in the new and bury to old? Full signing on of each specific nation as a province under the Constitution Act 1982 and Charter of Rights and Freedoms, with one step forward each nation dependent on population getting 4-8 seats in the House of Commons (not added extra, existing redistributed); and a set 10 block for all First Nations (+2 for Metis, +2 for Inuit) specifically in the senate, again redistribution, not adding. This then can allow for both the HoC and Senate to be re-worked Constitutionally and perhaps a social charter can be designed that includes housing, health care, education, right of choice in life, death and income guarantees for every Canadian. Which also flows into the next as #TRC has happened for our First Nations family, yet we have continued to ostracize/demonize another population whose story needs to be told- The Metis (Half-breeds). The children of colonialism and the fur trade. The Roman Catholic Church forged a cultural community within those of mixed from Aboriginal-French. Which gave our nation Louis Riel and Garbiel Dumont, brought Manitoba into Confederation, first human rights writing in Canada, and a battle for equality. One that as a nation we never saw for this group until the 1930’s when they were finally recognized as human beings. The story of the Half-breeds on the book is much more destructive, as the British (Scottish-Irish) did not have collectivist good, and belief in conquering through inter-marriage but rather through absorbing. Which created the choice the child was either Aboriginal or white, so one culture lost completely. That is just what our history books will tell us, what is the story on the ground? That which has been silenced? We already know of the land tracts and speculators swindling them out of the land for a low price. But what other harm/trauma lies underneath that needs to be told? Held as truth? And then as a true community choosing to move forward as one? This is why the TRC records with First Nations need to be kept in the national archive, need to be published and shared far and wide, so the story is known. It is part of us. But also part of the story is the choice to move forward as one and write a new story. This is the reconciliation piece of Truth and Reconciliation. But this also brings down to the microcosm. Where I have been struggling with my own Truth and Reconciliation within the United Church of Canada.The family pilgrimage for sacred community as has been written about, has brought us into a Northeast congregation of the UCC, where yes our son who is differently abled has found embrace. He is quite empathetic and a good reader of a person’s true energy, so when he goes on his own volition to join other kids you know the authenticity well. But aiding him to walk as the weather change is making his muscles sore into the Wonderkids, and seeing the mish mash of kids: other cultures, typically and differently abled just together being kids it hit in my heart. For it was seeing lived out today in church, what almost 10 years ago got me fired from the United Church Congregation that I surrendered any hope of ordination to choose inclusion. Just one of those aha moments, that when you start to unpack the day, and realizing the connections of everything…people…nature…energy…the Holy Mystery permeates all, and all is interconnected within it. So as with the differently abled community coming into full inclusion in the microcosm, I look to the TRC at the more macro level for inclusion at the national level… and to the two national party’s choosing leaders-Conservative and NDP I ask members to look to the core of the beautiful mosaic Canada is, and to vote your conscience for a leader, and for policy that shapes your party in that unity within our diversity to move forward from troubled waters of the past both recent and historic. Make the choice as Esther did, to find our voice, step out of the silence, and into the resounding thunder of justice, equality and belonging that resonates from the centre that is love. Out of this love, live our lives for a true difference, for a truly better world. We are thankful for these and all the good things of life. We recognize that they are a part of our common heritage and come to us through the efforts of our brothers and sisters the world over. What we desire for ourselves, we wish for all. To this end, may we take our share in the world’s work and the world’s struggles. An end note aside: To Bernie Van De Walle (my theology professor at Canadian Theological Seminary)-I finally fully get your comment about reading my theolgoy through the lens of Woodsworth.